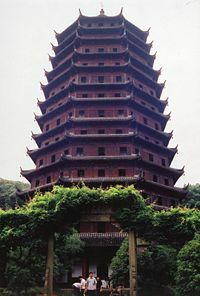 The Liuhe Pagoda of Hangzhou, China, built in 1165 C.E. during the Song Dynasty. Chinese architecture refers to a style of architecture that has taken shape in Asia over the centuries. The structural principles of Chinese architecture, determined by environmental conditions and social concepts, have remained largely unchanged for thousands of years, except for the decorative details. Buildings were situated on earthen platforms and made of timber frames, with overhanging eaves to protect their earthen walls and a structure of dougong (brackets) supporting a heavy, tiled roof. This gave the buildings a strong horizontal emphasis. Confucian preoccupation with hierarchy dictated the placement of rooms and buildings in a symmetrical arrangement along a central axis. Buildings constructed for the imperial family and for religious purposes followed the same basic structural principles as those of commoners, on a much grander scale. Since the Tang Dynasty, Chinese architecture has had a major influence on the architectural styles of Japan, Korea, and Vietnam. The modernization of China, beginning in the middle of the nineteenth century, led to the construction of buildings for new purposes, such as offices, shopping centers and convention halls, using a blend of Western and traditional Chinese architectural styles. 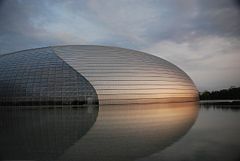 Following several decades during which architects attempted to embody Communist political ideals in their designs, China’s increasing participation in the global economy and preparations for the 2008 Olympic Games in Beijing resulted in an openness to innovation and the hiring of internationally-known foreign architects to construct landmark buildings. 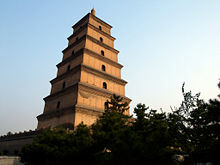 The Giant Wild Goose Pagoda, built in 652 during the Tang Dynasty. The most important feature is an emphasis on the horizontal axis, in particular the construction of a heavy platform with a large roof that appears to float above it, with little emphasis on the vertical walls. Chinese architecture stresses the visual impact of the width of the buildings. The interiors of the halls and palaces in the Forbidden City have rather low ceilings when compared to equivalent stately buildings in the West, but their external appearances suggest the all-embracing nature of imperial China. This emphasis on the horizontal axis may have been dictated by the timber-frame construction supporting a heavy tiled roof that is prevalent throughout Chinese architecture, which limited the height that could be achieved in each story of a building. The absence of load-bearing walls placed a greater importance on foundations and roofs. Buildings were constructed on platforms of rammed earth or stone both to indicate their social importance and to protect the wood timbers from flooding, moisture and rot. The earthen walls used in most buildings necessitated wide overhanging eaves to protect them from rain and snow. Another important feature is the emphasis on articulation and bilateral symmetry and balance, found everywhere in Chinese architecture, from palace complexes to humble farmhouses. Buildings and building complexes are constructed around a central room or hall, with additional buildings or rooms of equal numbers and sizes added on either side. Rooms and halls are designed for specific purposes, and their positions and sizes are determined by their intended use. Whenever possible, plans for renovation and extension of a house maintain this symmetry, if there are enough funds available to add construction on both sides of a building. Confucianism was a powerful formative influence on Chinese architecture. The Classic of Rites, said to have been edited by Confucius (551 – 479 B.C.E.) himself, summed up the theory of using the axial symmetric layout of a complex of buildings to distinguish the status of the elite from the lowly. This concept, called the theory of Ze Zhong Lun, or “choosing the center,” stated that main halls should be built in the most important position near the center of the axis. The Book of Changes, another Confucian classic, emphasized that architecture should be an expression of greatness and magnificence, firmness and grandeur. A great hall should manifest beauty and dignity consistent with its social importance. The Confucian school advocated a "gentle and honest and simple" artistic style, pursuing universal harmony, in which each part should not be too prominent. Much of traditional Chinese architecture is characterized by buildings or building complexes that occupy an entire property but enclose open spaces within themselves. There are two forms of enclosed spaces: the open courtyard (院) and the "sky well" (天井). The use of open courtyards is a common feature in many types of Chinese architecture. It is best exemplified in the siheyuan (Chinese: 四合院; pinyin: sìhéyuàn), a historical type of residence commonly found throughout China and particularly in Beijing, which consists of an empty space surrounded by buildings connected with one another directly or through verandas. Although large open courtyards are less commonly found in southern Chinese architecture, the concept of an "open space" surrounded by buildings, which is seen in northern courtyard complexes, can be seen in the southern building structure known as the "sky well." This structure is essentially a relatively enclosed courtyard formed from the intersections of closely spaced buildings and offering a small opening to the sky from the floor up through the roof space. The projected hierarchy, importance and use of buildings in traditional Chinese architecture are based on the strict placement of buildings in a property/complex. Buildings with doors facing the front of the property are considered more important than those facing the sides. Buildings facing away from the front of the property are the least important. Buildings in the rear and more private parts of a property are held in higher esteem and reserved for elder members of the family, while buildings near the front are typically for servants and hired help. Front-facing buildings in the back of a property are designated especially for celebratory rites and for the placement of ancestral halls and plaques. In multiple courtyard complexes, the central courtyard and its buildings are considered more important than peripheral ones, which are often used for storage or as servants’ rooms or kitchens. Confucianism emphasized maintaining hierarchic order and the distinction between the elite and the lowly and the great and small by means of size, quantity, height, placement, color and ornamentation. As the Confucian system of government developed, laws were passed dictating exactly the type and size of house that could be occupied by each level of the political and social hierarchy. The use of certain colors, numbers and the cardinal directions in traditional Chinese architecture reflected belief in a type of immanence, in which the nature of a thing could be wholly contained in its own form, without reference to an evanescent belief. The earliest Chinese text on architecture, "Kao Gongji" (Notes on the Inspection of Engineering Work), written during the Zhou dynasty (1122 – 256 B.C.E.) laid out the plans for the capital city and palace of Luoyi and established basic principles that were never disputed for centuries afterwards. Beijing, as reconstructed throughout the fifteenth and sixteenth centuries, remains the best example of traditional Chinese town planning. The common use of curtain walls or door panels to delineate rooms or enclose a building, with the general de-emphasis of load-bearing walls in most public buildings, palaces and halls. The use of large structural timbers for primary support of the roof of a building. Wooden members, usually large trimmed logs, are used as load-bearing columns and lateral beams for framing buildings and supporting the roofs. These structural timbers are prominently displayed in finished structures. Although structural walls are also commonly found in Chinese architecture, timber-framed architecture is preferred when economically feasible. Wood framed structures have more resistance to the strong winds and earthquakes which frequently occur in China. Gabled roofs, almost omnipresent in traditional Chinese architecture, while flat roofs are uncommon. Dougong (brackets) and queti (ch’ueh-ti, cornices) used to support the roof. Dougong brackets reinforce and connect beams and columns, and provide the principle support for the roof by transferring its weight onto the columns. The dougong bracket is the basic unit of a traditional Chinese building, and all other parts of the building are measured into proportion to its size. Queti, which became popular during the Ming (1368 – 1644) and the Qing (1644 – 1911) dynasties, reinforce the columns and shorten the span between two beams. Straight inclined: Roofs with a single incline. These are the most economical type of roofing and are most prevalent in more common constructions. Sweeping: Roofs with a sweeping curvature that rises at the corners of the roof. The curves are created by means of an incremental series of interlocking dougongs (brackets). These types of roof construction are usually reserved for temples and palaces, although they may also be found in the homes of the wealthy. In palace and temples, the ridges of the roof are usually highly decorated with ceramic figurines. Models of watchtowers and other buildings made during the Eastern Han Dynasty (25–220 C.E. ); while these models were made of ceramics, the real versions were made of easily perishable wood and have not survived. As early as 8000 years ago, the Chinese had begun constructing wooden structures above ground. Later, buildings were also constructed using rammed earth, stone, felt and metals, but wood remained the primary building material. Excavations of the early Chinese Neolithic Hemudu Culture (5200 B.C.E. to 4500 B.C.E. ), in Yuyao County, Zhejiang Province, revealed houses, generally 23 meters long and 7 meters deep, with a front porch about 1.3 meters deep, made by driving square wooden piles into the ground. Keel plates and floor boards were placed on the piles to create a base on which wooden poles were erected to support a roof. The poles were joined by inserting a tab carved at the end of one other pole, the tenon, into a rectangular slot, called a mortise, cut into the other pole. Tongue-and-groove joints between the floor boards indicate advanced carpentry skills. By the third century B.C.E. Chinese had begun building structures with bricks and arches. Large hollow bricks were produced between the 5th and 3rd centuries B.C.E., and wedge-shaped bricks with a mortise one side and a tenon on the other were made during the Han dynasty (206 B.C.E. – 220 C.E.). These were used mainly in the construction of tombs and sewer tunnels underground. From the Tang Dynasty (618–907) onwards, brick and stone architecture gradually became more common and replaced wooden edifices. During the fifth and sixth centuries C.E. bricks were used in some above-ground structures, such as the Xumi Pagoda built in 636. In the Ming dynasty (1368 – 1644) bricks were used to build the walls fortifying cities. Bricks came into use for common structures during the Qing dynasty. Stone was also used, mainly for the construction of bridges. The stone arch Zhaozhou Bridge in Heibei, completed in 617, preceded European stone arch bridges by several centuries. The Great Wall of China is the best known stone structure in China. Unlike other building construction materials, old wooden structures often do not survive because they are more vulnerable to weathering and fires and are naturally subjected to rotting over time. Until 1937, there were no known fully wood-constructed Tang Dynasty buildings in existence; the oldest, discovered in 1931, was the Guanyin Pavilion at Dule Monastery, dated 984, from the Song dynasty. In 1937, architectural historians Liang Sicheng (1901–1972), Lin Huiyin (1904–1955), Mo Zongjiang (1916–1999), and Ji Yutang (1902–c. 1960s) discovered that the East Hall of Foguang Temple on Mount Wutai in Shanxi was reliably dated to the year 857. The ground floor dimensions for this monastic hall are 34 by 17.66 m (111 ft by 57 ft). A year after the discovery at Foguang, the much smaller main hall of nearby Nanchan Temple on Mount Wutai was reliably dated to the year 782, A total of six Tang era wooden buildings have now been found. 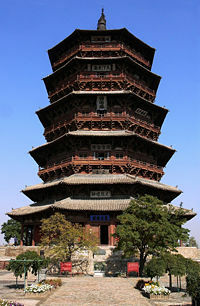 The oldest extant multistory wooden pagoda that has survived intact is the Pagoda of Fogong Temple from the Liao Dynasty, located in Ying County of Shanxi. The East Hall of Fogong Temple features only seven types of bracket arms in its construction; the eleventh century Pagoda of Fogong Temple features a total of 54. 斗拱 dougong interlocking wooden brackets, often used in clusters to support roofs and add ornamentation. The houses of commoners, bureaucrats, merchants and farmers, tended to follow a set pattern: the center of the building would be a shrine for the deities and the ancestors, and would also be used during festivities and ritual ceremonies. On both sides of it were bedrooms for the elders; the two wings of the building (known as "guardian dragons" by the Chinese) held rooms for the junior members of the family, as well as the living room, the dining room, and the kitchen, although sometimes the living room could be very close to the center. Sometimes extended families became so large that one or even two extra pairs of "wings" had to be built. This resulted in a U-shaped building around a courtyard suitable for farm work; merchants and bureaucrats, however, preferred to close off the front with an imposing front gate. Laws dictated the number of stories, the length of the building and the colors used, according to the owner's class and status. The yellow roof tiles and red walls in the Forbidden City (Palace Museum) grounds in Beijing, built during the Yongle era (1402–1424) of the Ming Dynasty. In ancient Chinese writings, the Chinese word for palace, gong, referred to a simple house. During the Qin Dynasty (221- 207 B.C.E. ), gong gradually came to mean the group of buildings in which the emperor lived and worked. These palaces became increasingly larger and grander in scale, growing into veritable cities, often referred to as gongcheng (palace city). The Efanggong of the First Emperor of Qin measured "5 li (2 1/2 km) from east to west and 1,000 paces from north to south." The Weiyanggong of the Western Han Dynasty (206 B.C.E. -24 C.E. ) had as many as 43 halls and terraces inside an 11-kilometer perimeter. The Forbidden City of Beijing, the imperial palace for both Ming and Qing emperors (1368-1911), covers an area of 720,000 square meters and embraces numerous halls, towers, pavilions and studies. It is the largest ancient building complex in the world.Other imperial residences, such as the Summer Palace (now Yiheynan Park) with its outstanding garden, the imperial summer resort at Chengde and the Huaqingchi thermal spa near Xi'an were also referred to as gongs. A zhaigong was a residence where the emperor prepared himself to offer sacrifice at grand ceremonies by practicing abstinence. Inside a great gong, certain individual buildings were also called “gongs.” The Qing emperors lived in Qianqinggong (Palace of Heavenly Purity) within the Forbidden City, and the living quarters of the empresses were at Kunninggong (Palace of Female Tranquility). Imperial concubines of various ranks were housed in six gongs or palace quadrangles on either side of the central axis of the Forbidden City. When emperors or empresses died, they were buried in digong (underground palaces). Great religious buildings, such as the lame temple of Beijing (Yonghegong) and the Potala Palace in Lhasa were also called gongs by the Chinese. Daoist temples were called sanginggong (palace of triple purity). In modern China the name gong is used for “palaces of culture” and other large secular public buildings. Certain architectural features were reserved solely for buildings built for the Emperor of China. 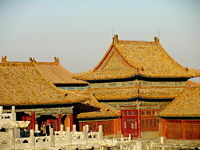 One example is the use of yellow roof tiles; yellow was the Imperial color, and yellow roof tiles still adorn most of the buildings within the Forbidden City. The Temple of Heaven, however, used blue roof tiles to symbolize the sky. The roofs were almost invariably supported by brackets ("dougong"), a feature shared only with the largest of religious buildings. The wooden columns of the buildings, as well as the surface of the walls, tended to be red in color. Black was also a favorite color often used in pagodas because of the belief that the color black inspires the gods to descend to the earth. The Chinese dragon, an emblem reserved for Imperial China, was used heavily on Imperial architecture - on the roofs, on the beams and pillars, and on the doors. Only the buildings used by the imperial family were allowed to have nine jian (間, space between two columns); only the gates used by the Emperor could have five arches, with the center one reserved for the Emperor himself. The buildings faced south because a cold wind came from the north. 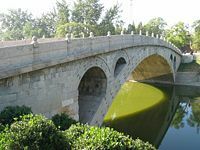 The Zhaozhou Bridge, built from 595–605 during the Sui Dynasty. It is the oldest fully-stone open-spandrel segmental arch bridge in the world. Beijing became the capital of China after the Mongol invasion of the thirteenth century, completing the easterly migration of the Chinese capital begun during the Jin dynasty. The Ming uprising in 1368 reasserted Chinese authority and fixed Beijing as the seat of imperial power for the next five centuries. The Emperor and the Empress lived in palaces on the central axis of the Forbidden City, the Crown Prince at the eastern side, and the concubines at the back (the numerous imperial concubines were often referred to as "The Back Palace Three Thousand"). During the mid-Qing Dynasty, the Emperor's residence was moved to the western side of the complex. It is misleading to speak of an axis in the Western sense of facades ordered in a visual perspective; the Chinese axis is a line of privilege, a series of gates and pavilions regulating access. Numerology heavily influenced imperial architecture. The number nine, the greatest single-digit number, was seen as a symbol of the supreme sovereignty of the emperor and was used in much of the construction. The Forbidden City in Beijing is said to have 9,999 rooms - just short of the mythical 10,000 rooms in heaven. Metal studs on palace gates are arranged in nine rows of nine each. 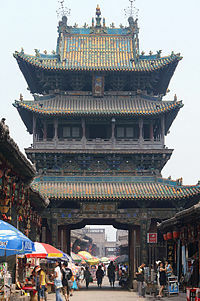 The picturesque towers guarding the four corners of the palace compound each have nine beams and 18 columns, and the three famous screen walls each have nine dragons. Ancient palaces generally consist of nine courtyards or quadrangles. The importance of the East (the direction of the rising sun) in orienting and siting Imperial buildings is a form of solar worship found in many ancient cultures, where the notion of Ruler is affiliated with the Sun. The tombs and mausoleums of imperial family members, such as the eighth century Tang Dynasty tombs at the Qianling Mausoleum, are part of the imperial tradition in architecture. These above-ground earthen mounds and pyramids had subterranean shaft-and-vault structures lined with brick walls beginning at least during the Warring States (481–221 B.C.E.). A golden-tiled roof pavilion atop the main hall of the Putuo Zongcheng Temple near Chengde, built from 1767-1771 during the reign of the Qianlong Emperor. The Chinese pavilion (ting, also meaning “kiosk”) is built of wood, stone or bamboo in any of a variety of shapes including a square, triangle, hexagon, octagon, a five-petal flower, and a fan. All pavilions are supported by columns and have no walls. Pavilions serve many purposes. In parks or in scenic places, they are built on slopes which command a broad view, or next to water to add a scenic accent. Wayside pavilions called liangting (cooling kiosk) provide a resting place for weary travelers. A "stele pavilion" protects a stone tablet engraved with the record of an important event. Pavilions also stand by bridges or over water-wells, where they are built with dormer windows so that the sun’s rays can enter the well. (It is believed that water untouched by the sun can cause disease.) Modern pavilions are erected in urban areas as postal stalls, newsstands or refreshment stands. The celebrated Baoyunge Pavilion of Precious Clouds in Beijing's Summer Palace, popularly known as the "Gold Pavilion,” is cast entirely in bronze, including its roof and columns. It is metallic blue in color, 7. 5 meters tall and weighs 207 tons. The largest pavilion in China, the ancient Kuoruting (the Pavilion of Expanse), is also in the Summer Palace. It has a floor space of 130 square meters. Its octagonal roof converges in a crown on top and rests on three rings of columns (24 round columns and 16 square ones) and has two eaves. The tai, an ancient architectural structure, was a high elevated terrace with a flat top, built of earth and stone and surfaced with brick. Tais served as platforms on which palaces were erected. The Round City of Beihai Park in Beijing is a tai 5 meters (16 ft) high, with an area of 4,500 square meters (48,438 square feet), and contains a main hall with side corridors. Tai were also used as observatories and as military lookouts. Along the Great Wall, there is a square tai every 300 meters (980 ft) or 400 meters (1,300 ft) from which the garrison troops kept watch. Ruins of fortifications in the form of earthen terraces can still be seen along the Silk Road. The earliest walls and platforms in China were of rammed earth construction, and over time, brick and stone became more frequently used. This can be seen in ancient sections of the Great Wall of China, while the brick and stone Great Wall seen today is a renovation of the Ming Dynasty (1368–1644). Tenon and mortice work of tie beams and cross beams, from Li Jie's building manual Yingzao Fashi, printed in 1103. “Lou” refers to any building of two or more stories with a horizontal main ridge. Chonglou ("layered houses") are mentioned in historical records from the Period of the Warring States (475-221 B.C.E.). The upper floor of smaller, two-storied private homes generally housed the owner’s study or bedroom. Buildings with several stories built in parks and scenic places provided vantage points from which to enjoy the view. Ancient cities had bell and drum towers (zhonglou and gulou), usually palatial buildings with four-sloped, double-caved, glazed roofs, all-around verandas and eaves supported by colored and carved dougong brackets. They housed a big bell or drum which was used to announce the time; local officials would open the city gates at the toll of the bell early in the morning and close them with the strike of the drum in the evening. During the Ming and Qing dynasties (fourteenth to twentieth centuries), an archery tower stood in front of each city gate of Beijing as a fortification. Two of them still stand at Qianmen and Deshengmen gates. Also in Beijing, a "corner tower" still remains relatively intact at the south-eastern corner of the old Inner City in Beijing. The art of constructing tall buildings was well-developed in ancient China. The wooden frameworks of complex multi-storied towers were fixed together with dougong brackets without the use of a single metal nail. Yueyang Tower in Hunan and Huanghelou (黄鹤楼, Tower of the Yellow Crane) in Wuchang are examples of ancient towers, though they have been reconstructed many times. The Putuo Zongcheng Temple, built from 1767 to 1771 during the reign of Qianlong, represents a fusion of Chinese and Tibetan architectural style. Buddhist architecture characteristically followed the imperial style. A large Buddhist monastery normally had a front hall, housing the statue of a Bodhisattva, followed by a great hall, housing the statues of the Buddhas. Accommodations for the monks and the nuns were located at the two sides. Some of the greatest examples of Buddhist architecture are the eighteenth century Puning Temple and Putuo Zongcheng Temple. Temple roofs, made of glazed ceramic tiles, were curved upward at the eaves to ward off evil spirits, which were believed to travel in straight lines. The most distinctive Buddhist structures in China are the stupa (t'a) in the form of upturned bowls, or pagodas (storied towers) used to house sacred objects and relics of the Gautama Buddha. During the second and third centuries, pagodas were made primarily of wood. In the Sung dynasty (960 – 1279) they were given a tetragonal form. Tang dynasty pagodas were shaped as octagons or diagonals. The number of stories varied with each pagoda. Each successive story from the base to the summit decreased in height but retained the same proportions.Some wooden residential towers, watchtowers, and pagodas that are no longer in existence are known to us through ceramic and bronze representations, and through painting and poetry. The Songyue Pagoda built in 523 is the oldest extant pagoda in China; constructed of brick instead of wood, it has endured for 15 centuries. Daoist architecture followed the style of commoners’ dwellings. The main entrance was usually at the side, to discourage demons who might try to enter the premises. The main deity was located at the main hall at the front, the lesser deities in the back hall and at the sides. The tallest pre-modern building in China was built for both religious and martial purposes. The Liaodi Pagoda built in 1055 C.E. stands at a height of 84 m (275 ft), and although it served as the crowning pagoda of the Kaiyuan monastery in old Dingzhou, Hebei, it was also used as a military watchtower for Song Dynasty soldiers to observe potential Liao Dynasty enemy movements. Zhuozheng Garden in Suzhou, Jiangsu province, one of the finest gardens in China. 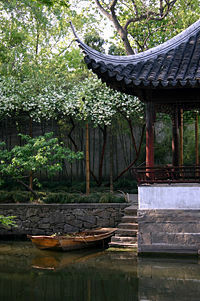 During the Song dynasty (960 – 1279), wealthy Chinese began designing gardens around their residences. Gardens incorporated the elements of “mountain” and “water,” using rocks and ponds to emulate the natural world. Inner and outer walls with moon-shaped doorways and small windows in the shapes of vases; pavilions; covered walkways and bridges added interest and provided resting places from which to admire views of the garden. Chinese gardening reached its height in Suzhou during the Ming and Qing dynasties.There were over 280 private gardens then in Suzhou and landscaping became an art with established masters. 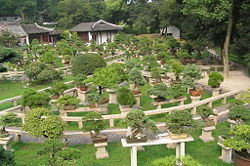 There are 69 gardens in and around Suzhou that are still in good condition. In 1997, UNESCO added four of the private gardens of Suzhou to the World Heritage list, extending this in 2000 to include the historic section of the city and five other gardens in the area. Modern Chinese architecture generally refers to the architecture built since the middle of the 19th century. Western architecture appeared in China when the treaty that ended the first Opium War in 1842 granted the British access to five Chinese ports. Western nations built foreign buildings to house consulates, offices, banks, restaurants, and clubs in the territories they leased from the Chinese. Though Chinese architectural styles still dominated traditional building, new types of buildings such as theaters, performance halls, restaurants, hotels, offices, and department stores blended Western and Chinese elements. After People’s Republic of China was founded in 1949, the planned economic system accelerated the development of a “modern” architectural style. Buildings of the “Returning to the Ancients’ Period” were characterized by large roofs; the style of the “New Communist Buildings Period” is represented by the Big Ten Buildings for National Celebration, and the “Cantonese Style Period” attempted to integrate modern design with a nationalistic spirit. The Great Hall of the People, on the western edge of Tiananmen Square in Beijing, built by volunteers in ten months during 1958 and 1959, is used for legislative and ceremonial activities by the People's Republic of China and the Communist Party of China. It has a floor space of more than 170,000 square meters (1,829,864 sq. feet), encompassing 300 meeting halls, lounges and office rooms and a 10,000-seat auditorium for meetings of the National People’s Congress. Since the 1980s, Chinese architectural design has gradually become more open, and exhibits multiple styles. Throughout the twentieth century, Western-trained Chinese architects attempted to incorporate traditional Chinese designs into modern (usually government) buildings, with only limited success. The pressure of rapid urbanization throughout contemporary China for speedier construction and higher floor area ratio, has decreased the demand for traditional Chinese buildings, which are normally less than three levels, in favor of modern architecture. However, the traditional skills of Chinese architecture, including major carpentry, minor carpentry, masonry, and stone masonry, are still applied to the construction of vernacular architecture in the vast rural area of China. The Beijing National Stadium known as Bird's Nest stadium. Constructed for 2008 Summer Olympic. China’s increasing participation in the global economy and preparations for the 2008 Olympics in Beijing resulted in the hiring of internationally-known foreign architects to construct landmark buildings. The National Grand Theater, an enormous titanium and glass dome surrounded entirely by water, was designed by French architect Paul Andreu. The Bird's Nest Stadium was designed by Swiss architects, and Dutch architect Rem Koolhaas designed the new headquarters for China's state television network, CCTV, two L-shaped high-rise towers leaning inward and linked at the top and bottom. The government spent $1.5 billion on these buildings and rewrote its engineering codes so that they could be erected. The new Beijing Airport can handle up to 60 million people in one year. 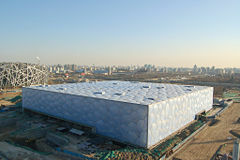 The Beijing National Aquatics Centre, also known as the “Water Cube,” was designed by PTW Architects from Sydney, Australia in collaboration with CSCEC (China State Construction Engineering Corporation) International Design and Arup to host water sports events during the 2008 Olympics. Chongming Dongtan Ecological Town, on Chongming island in north Shanghai, will be a communications and entertainment center with educational sites, high-technology industries and dwelling houses and a population of 50,000. Shanghai World Finance Center, designed by Kohn Pedersen Fox Associates from New York, will reach a new world record of 429 meters when completed. ↑ Nancy Shatzman Steinhardt, "The Tang Architectural Icon and the Politics of Chinese Architectural History," The Art Bulletin 86 (2)(2004): 228–254. 228–229. ↑ Chinahotel.com Hemudu Village Retrieved August 10, 2008. ↑ XA Business Hemudu Ruins Retrieved August 10, 2008. ↑ Regenttour.com. Sights & Attractions — Banpo Neolithic Village Museum Retrieved August 10, 2008. ↑ Qinghua Guo, "Tomb Architecture of Dynastic China: Old and New Questions," Architectural History 47(2004): 1–24. 12. ↑ Thinkquest.org Chinese Architecture Retrieved August 8, 2008. ↑ Lisa Chow, Morning Edition, China Looks to More Modern Architecture NPR.org. (July 18, 2008) Retrieved August 10, 2008. ↑ Chintravel.com Modern Chinese Architecture Retrieved August 10, 2008. Steinhardt, Nancy Shatzman, "Liao: An Architectural Tradition in the Making," Artibus Asiae 54 (1/2) (1994): 5–39. Steinhardt, Nancy Shatzman. "The Tang Architectural Icon and the Politics of Chinese Architectural History," The Art Bulletin 86 (2) 2004): 228–254. Yin Yu Tang: A Chinese Home To explore an in depth look into the ancient architecture of the Huang family’s domestic life in China, the Yin Yu Tang house offers an interactive view of the typical domestic architecture of the Qing dynasty. This page was last modified on 13 February 2017, at 17:19.